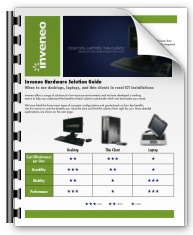 Inveneo offers a range of solutions for low-resource environments. We have developed an informational matrix to help you understand the benefits of each solution and decide which one best meets your needs. The matrix lists the three major types of computer configurations and grades each on four key benefits. Use this matrix to rank the benefits you value the most and find the solution that’s right for you. More detailed explanations of the configurations and benefits are below. Desktop: Most suitable for difficult environments is the very low-power-consumption Inveneo High-Performance Computing Station, intended for regular use at a single location. This system provides excellent performance with a very low 5-year Total Cost of Ownership (TCO). Laptop: A portable computer, such as the Inveneo Classmate PC Laptop, that is small and light and contains an integrated screen and keyboard. Laptops are designed for maximum portability and use wherever needed. Laptops can be fragile, and are always more expensive to maintain than desktops. Cost Effectiveness per User: Thin clients use a single CPU to serve multiple screens. Therefore, the hardware cost per user can be dramatically lower than if a separate computer is purchased for each user. Almost all laptops are more expensive at most performance levels compared to typical desktops. Durability: Low-power consumption desktops with hardened hardware and software are the most durable computers in hot, dusty environments. Individual components, such as keyboards or mice can be easily and inexpensively replaced if there is a problem, whereas laptops are more expensive to repair or replace. Mobility: Laptops are the smallest and lightest computers, designed for use on any flat surface, including your lap, while thin clients must be located closer to each other to operate and the server PC is not easy to move. Desktops can be moved, but are not truly portable. Performance: Desktops and Laptops can be equally powerful, because each has its own CPU. With a Thin Client system the power of the single CPU must be shared among all the users, so graphics performance, in particular, is the lowest of the three types.